A small and robust stamp! The self-inking Printy 4941 has space for a maximum of 6 lines, set out in an impression area of 41 x 24 mm. The online design wizard allows users to create a custom rubber stamp. Stamps can be personalised with: a message, name, address, signature, email address or contact details. With an added image or logo if required. 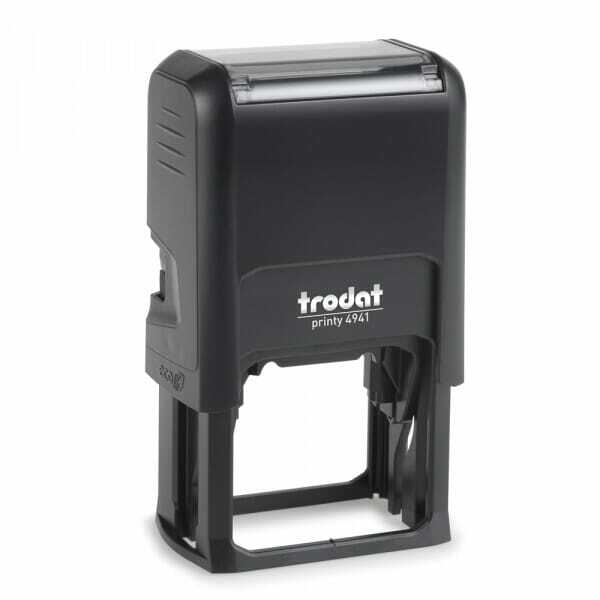 Being one of Trodat's bestsellers, the stamp is produced climate-neutral: with maximum possible content of recycled plastic and the rest is compensated with investments in climate-protection projects. 6/4750 replacement pads fit the 4941. They are available in the 5 standard colours: black, blue, red, green and violet. Customer evaluation for "Trodat Printy 4941 41 x 24 mm - 6 lines"